Wilson's Fed was created to bailout banks and others while allowing government to spend money it doesn't have. We continue along that path today with remarkable and accelerated vigor. 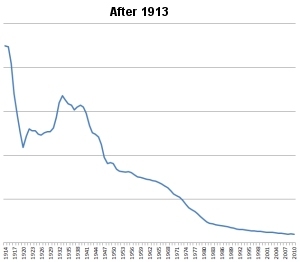 Roosevelt's New Deal fostered economic policies that prolonged the depression and increased the debt by their own admission. Our leaders today pursue the same policies with the same result. Johnson's giveaways of the Great Society will simply never be paid for in their current form. Those programs have generated unfunded Federal obligations of $70 to $100 Trillion depending on the source you use. Debt is over $15 Trillion and is going up by a million bucks every half minute or so and our current administration, by its own admission has no plan for reducing it. Gas prices spiral upward not because we're not drilling like Republicans say and not because there is more demand from a rising economy like Democrats propose. The reason is that the dollar is losing value. An ounce of gold bought a full suit of clothes from hat to shoes in 1787. The same is true today, but an ounce of gold was $20 then and is $1600 now. It's easy to have trouble grasping just how big, big numbers really are, but most of us can get our arms around a million and we know it's a lot. A million seconds is 12 days... a trillion seconds is 31,700 years. Think about that. Who's going to pay for 15 of those let alone 100? Especially when half our population pays no taxes and a quarter are taking money from the government instead of providing for themselves. Our leaders talk all around the edges of these issues without addressing them with solutions. We are headed for disaster in the form of a valueless dollar. Whether we get there in a controlled downward spiral that takes decades or a sudden lurch into the pit of despair is dependent upon how our leaders handle the debacle, but either way, it's not going to be pretty. 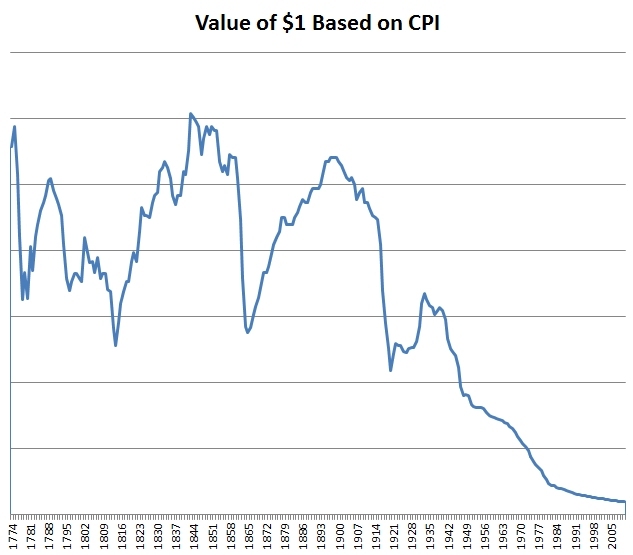 Here's a chart showing the value of the dollar over the entire history of our country. Notice what caused the drop in value as the years progress. The Revolution (and initial flirtation with central banking), the War of 1812, the Civil War, World War I and World War II are all easily identified. But what about recent history? Why did the dollar never recover from its slide after WWII? Because the government began printing money and hasn't stopped. 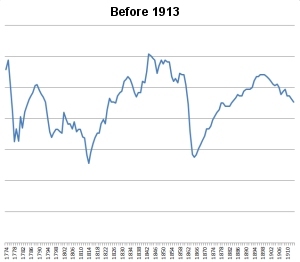 Let's take a look at the value of a dollar before 1913 when the Fed was established and compare it to one after 1913. Can you say FEDERAL RESERVE? This is the clearest evidence I can imagine that shows the fraud and theft of American wealth that has been propagated on us by our government.